Today, we’re taking on the idea of financial freedom – and how we suggest redefining it to better fit your life. Running away from something or acting out of fear is unlikely to solve the actual problem you have. It’s nice to have the freedom that money affords, but thinking “if I just have $X amount of money so I can walk away from anything, then I’ll be happy” is not a good approach. That’s not how life works. Financial freedom is not all about amassing a huge amount of money in a bank account. It’s more about building a life in which you get to do what you want with your time, and having multiple ways of financially supporting that life — be it through savings, investments, or continued income. Money can help you leverage your situation to get more of what you want, but it’s not the end-all be-all. It’s a tool to help you along the way. Real financial freedom is ownership over how you spend your time. Don’t get so wrapped up in today that you fail to think about the long-term — but don’t obsess over the future so much that you never look at what’s right in front of you, either. Find the balance. 0:23: There’s the “popular” way to define what financial freedom means — and there’s what financial freedom means to us (that we think is more useful to more people who don’t necessarily want to go to extremes, but want to balance living well today while still planning responsibly for tomorrow). 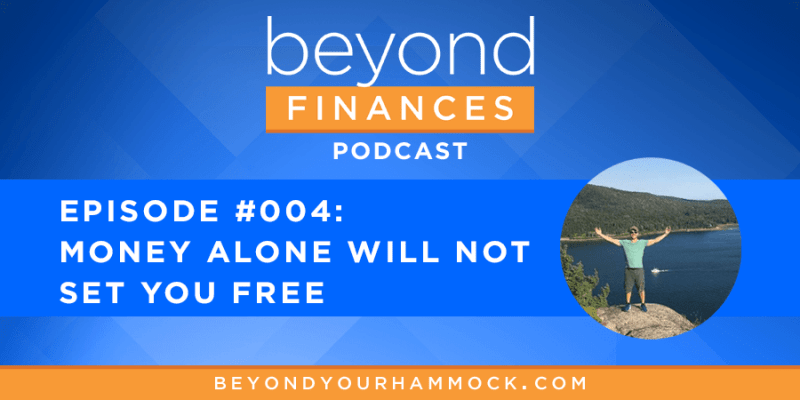 0:57: When we talk about financial freedom, or financial independence, we’re talking about our life and how we can live the way we want and have our money support that (rather than getting obsessed over hitting a certain “number” or net worth goal). 1:20: When most people talk about this topic, it’s all about some magic number to have in net worth or in assets. But this way of looking at being financially free assumes that life will move linearly — and we know life is not linear! 1:30: Not to mention, running away from something is never going to give you as good of a result as running toward something. And a lot of the “financial freedom” conversation is centered around people who are motivated by running away from jobs or lives they don’t like. (There’s also a lot of motivation-by-fear — fear of the future, fear of the unknown). 2:00: A lot of people want to mitigate their risk of being financially insecure. But by trying to chase down and secure a future guarantee because you fear what’s happening in your life, or you fear what could happen, you risk just as much. It’s just a different risk (i.e., missing out on your life as it’s actually happening). 2:05: Being unhappy or afraid of what could happen because you don’t have control over some part of your life is a pretty negative outlook — but it doesn’t need to be this way. We want to paint a better picture by expanding what financial independence could mean to you. 2:35: The official definition of financial independence is having enough wealth to live on without working. Financially independent people have assets that generate income (cash flow) that is at least equal to their expenses. 2:49: On the surface, this sounds pretty good! But in practice, things can get funky and out of whack if you’re motivated by negative factors rather than positive ones. 3:02: With anything in life, not just money, running away from it or acting out of fear is unlikely to solve the actual problem you have. If you’re trying to get away from a job, a responsibility, person; whatever it is you don’t like in your life — more money is not going to solve the underlying problem. It’s nice to have the freedom that money affords, but thinking “if I just have $X amount of money so I can walk away from anything, then I’ll be happy” is not a good approach. That’s not how life works. 3:48: You have to ask, “why don’t you like this thing? Why aren’t you happy?” If you don’t like your job and want to get out of it, why? If it’s because you don’t like your boss, what about your boss makes you feel that way? Or if you have a problem with the type of work you’re doing, what about that work isn’t inspiring or is leaving you unfulfilled? If you ask these questions about what isn’t clicking for you, you can start to get into a conversation about values — and where what you’re doing doesn’t align with what you value, there’s going to be a lack of interest or satisfaction. 4:08: A lot of people want to run away from that and blame something specific but superficial — it’s this boss, or it’s my job title, or it’s my office, or it’s my coworkers. They can name something specific but the real issue might be a lack of fulfillment from something bigger. If you can better align your life (and your money!) with your values, suddenly you have a lot more options for how you get to define what financial freedom could mean for you. 4:43: Kali used to be 100% on the traditional financial independence bandwagon — and she was trying to get out of a situation she didn’t like. Whatever she could do to get out of her current job sounded good, and being financially independent sounded like the perfect solution. 4:54: But the real problem? She didn’t really like her life as a whole at the time. There were deeper issues than just “I want out of this job.” She was also terrified about the future based on her experiences of graduating into the Great Recession and struggling to get her first jobs. That left her with a distorted and unrealistic view of what life was always going to be like, so her reaction was to think “I can’t let this happen to me again; I’m going to find a way to control this.” And financial independence seemed to offer more control… and a way out. But it wouldn’t have gotten to the root of her fears, unhappiness, or dissatisfaction. 5:52: At the time, this seemed like the perfect solution! But looking back now, the plan seemed so miserable: go to extremes to save as much of her income as possible, just so she could “retire” in her early 30s and try to squeak by on about $30,000 per year. 6:15: What she’s learned since then — and what she wishes other people who have an interest in financial independence would consider? Money alone cannot set you free. 6:28: When you get that money, you might be financially free by a certain definition in that you don’t have to go back to a job. But that doesn’t inherently mean you’re truly free in life because your spending per year is now limited and capped. You only have a certain pile of money to draw from, which can limit your choices or protect against various unknowns (unless, of course, you go back to work, which sort of defeats the purpose for a lot of people interested in financial independence). 6:58: When Kali reflects back on her run at financial independence, she admits she couldn’t see any of that. Due to a lack of self-awareness, she really thought her only problem was not having enough money. 7:17: Looking back, it’s hard to imagine a less-free way to live than being constrained to a particular amount of money and a particular lifestyle from early 30s to whenever-you-die years old. 7:46: All this being said, financial freedom is not a bad thing. In fact, it’s one of our biggest goals today. 7:57: Eric also had some life experiences that allowed him to see that money alone would not provide freedom or happiness. 8:08: After working in the corporate world at State Street and JP Morgan, Eric tripled his income over 6 years (which was helped by the fact he also graduated into a recession in 2002, so salaries were only going up in the subsequent years). 8:19: What he realized was that as his money went up, his happiness didn’t go anywhere. It allowed him to see there was a difference between “having more money” and “being happy.” They were two mutually exclusive things that both needed work to produce an enjoyable financial freedom in life. 8:42: Years later, starting Beyond Your Hammock allowed Eric to create work that connected him with his values and allowed him to do what he wanted to do, and feel motivated, and be able to live the life he wants to live. 8:57: Financial freedom is not all about amassing a huge amount of money in a bank account. It’s more about building a life in which you get to do what you want with your time, and having multiple ways of financially supporting that life — be it through savings, investments, or continued income. 9:26: We can’t say we can comfortably stop working and live off our investments, so we’re not technically “financially independent.” (We could be if we decided to move to a farmhouse in Kansas, perhaps, but that’s not the lifestyle we want). 9:37: But we’re financially free in a way because we’re living a life we enjoy, where we actually own our time. Ownership over your time is a huge piece of the value of being financially independent. 10:13: To Kali, true financial freedom is ownership of time. That’s a huge amount of freedom most people don’t have. Also, this whole idea of financial freedom exists on a scale: it’s not whether you absolutely are or absolutely are not financially free. 10:40: Having ownership over your time doesn’t necessarily mean you can get away with simply not working or not earning money. But if you can develop a life where you can earn money the way you want to earn it, that might afford you far more freedom than even someone who is technically financially independent and doesn’t have to work at all. If you can continue to work and earn an income, and your motivation isn’t to escape work, then you have a lot more choice about how you spend the money you have and the lifestyle you enjoy. 11:13: The combination of having ongoing income and a high savings rate is a key factor, too. Financial freedom is not just a lump sum of money. 11:31: As long as you have a sufficient income flowing in each year, you’re not going to run out of money (even if you don’t have a massive amount saved in the bank). People with passive income are very much financially free even if they’re not sitting on a massive net worth. 11:58: To quickly recap: real freedom comes down to choice over how you spend your time. Choosing how you spend your time is the biggest freedom there is. It’s also a good idea to be financially responsible while you’re working — even if it’s doing work you love — and set aside a good percentage of your income because you won’t always be able to work. 12:55: People tend to paint this idea of “financial freedom” as something that’s so simple, and easy, and something anyone can do. And yes, while a lot of people could make this their goal… the idea that you should just “save more” and you’ll be fine? Way too simplistic. 13:10: If you use really simple, general rules of thumb to try and figure out how much money to save and invest for financial independence, you could get into big trouble real fast. 13:28: Take compounding returns as an example. Yes, compounding is a magical force over time! But what a lot of the “simple math” behind financial independence fails to take into account is basic concepts any investment expert knows about — like sequence of returns. 14:15: When you introduce the element of risk, which you will face when you invest in the stock market, that’s when your sequence of returns is different. You’re not going to get a 7% return every single year — even though that might be your average return if you invest over the next 10 or 20 years. 14:37: What doesn’t get taken into account with a lot of these simplified rules of thumb and bad advice about reaching financial independence is the negative years, and what happens if you earn those negative returns early on in a set period of time. 15:15: Unfortunately, most financial media and financial bloggers just use simple averages when talking about investing. It’s pretty misleading when considering what will happen to your money in the market. 15:28: Here’s an example of how dramatically this could impact you: Let’s imagine you exist in this universe and also in a parallel universe. In both universes, let’s say you invested in a fund that, over the last 2 years, averaged a 25% return. 15:40: In the parallel universe, you had a 25% return each year you invested. You invest $100, and at the end of the first year you have $125. You keep the money invested and it grows to $156 at the end of the second year thanks to earning 25% again. You average rate of return is 25% and your portfolio is worth $156. 16:08: Now let’s look at what happened to you in this universe. You invest $100 in the fund that provided a 25% average return over the last 2 years in this scenario, too. But the sequence of returns happens to be different: the first year, you experience a -50% return, or a loss. Your $100 goes down to $50. In the second year, you fare much better and earn a 100% return! But because you lost in the first year, a return of 100% on $50 leaves you with a portfolio worth $100… $56 less than the same exact fund with the same exact average of 25% return. 16:41: In the first sequence, you get $156 at the end. In the second sequence, you get $100… which is no return at all, because remember, you invested $100 each time. Sequence of returns matters (and is completely different than average return). 17:07: Unfortunately, most online calculators and the vast majority of financial bloggers don’t take into account. You can’t just throw your numbers into a simple rule of thumb if you want to plan decades out into the future, or make decisions about what it takes to become financially independent. It requires more complex projections than that to ensure your success. Be careful not to reduce it down to something overly simple. 18:23: In times where sequence of returns is not working out in your favor — in other words, the market goes through a downturn right when you wanted to start living off your investments to cover your expenses — it’s great to have alternative sources of income you can toggle on and off, to be able to say “I don’t have to take money out of my investments right now.” Rather than shutting off your income completely by saying “I’m not working anymore,” a better approach might be to consider how you can keep some income that allows you to make money from something you really enjoy. 19:24: This conversation is one we wanted to share because unfortunately, so much of what you see or what’s highly visible online about financial independence is often unrealistic, it requires you to live at an extreme, and worst-case scenario it doesn’t even work because it’s relying on simplified rules of thumb that fail to take into account important details that will negatively impact the outcome of your strategy should you try to follow these guidelines. 19:41: There’s nothing wrong with financial independence or wanting to pursue it (again, it’s a big financial goal of ours). But it might be smart to take some time to define it for yourself, and understand why you’re pursuing this goal. Why is it important to you? If the answer comes down to the fact that you don’t like something about your life right now and you’re trying to get away from it, stop and take a step back and seriously consider what’s going on in your life that you don’t like. Think about what you could do differently right now to improve the situation… because just piling up a bunch of money somewhere is unlikely to solve the problem. 20:32: Money can help you leverage your situation to get more of what you want, but it’s not the end-all be-all. It’s a tool to help you along the way. 21:06: When you’re happy with your life and how you’re spending your time, you don’t have to get caught up in some race to get to $X amount in the bank or $X of net worth. You can create balance and enjoy yourself now, and still enjoy that freedom later on. 21:34: Taking away from today to add to tomorrow isn’t what we’re interested in. We save a certain percentage of income to make sure we’ll reach financial independence eventually, but we’re not willing to sacrifice today for the sake of some distant someday. 22:27: There are so many variables in life. Even if you manage to get countless assumptions right about your financial plan, all those variables mean you’ll need to make a lot of changes along the way. That’s why having a goal like “I just need [specific dollar amount] and then I’ll be fine” is a little misguided. 22:42: It’s more important to be able to adapt along the way. You need to adjust as things show up in your life, as you get more information. 23:17: Financial independence does not require you to sit and squirrel away every last cent as you hang back from living your life today on the hope that things will be different tomorrow. There are a LOT of means to the end of financial freedom. 25:00: Expect the conversation to evolve as you change, and your life changes. 25:15: There are so many things that are challenging in life. Financial freedom is not easy to achieve (nor is our experience one everyone can have). Not everyone has the capacity to save a big chunk of money — because you have to earn a big chunk of money to be able to do that. 25:48: If by hard work and chance and luck you are in that situation where you make a lot of money, be responsible. Be proactive. Take advantage of the opportunity; don’t squander or waste the opportunity. Don’t get so wrapped up in today that you fail to think about the long-term — but don’t obsess over the future so much that you never look at what’s right in front of you, either. Find the balance. If you have questions or comments, send us an email at team@beyondyourhammock.com. You can even chat with Eric about becoming a financial planning client at BYH by clicking here. And of course, we’d love to here what you think. Share your feedback by leaving your review on iTunes. It means a lot.